Winds from the east...well actually it is more like winds from the west coast of Southern California where Tanner Foust and Heather Hambright jumped into a chalk painting and enjoyed a bit of magic. My name is Heather and I am delighted to share our story with you. Earlier this year, Tanner mentioned a quirky aspiration of his- to own the signature striped coat that Bert wears in the Jolly Holiday scene in Walt Disney’s 1964 classic picture, Mary Poppins. I immediately checked online to see how much it would cost to make his dream come true. Unfortunately, the price of a look-a-like Bert coat was no jolly holiday. I closed my computer and thought my desire to get him the classic coat would be no more than a piecrust promise. Easily made, easily broken. I suppose it would be helpful to mention that Tanner and I met in a tiny town call Mishawaka in Indiana. We attended a small college there and were never able to really celebrate Halloween together due to the frigid October temperatures and the pressures of school that did not desist for a night of trick-or-treating. This Halloween was to be our first time dressing up together and we were going to make it good. While day dreaming about Halloween, it suddenly dawned on me. 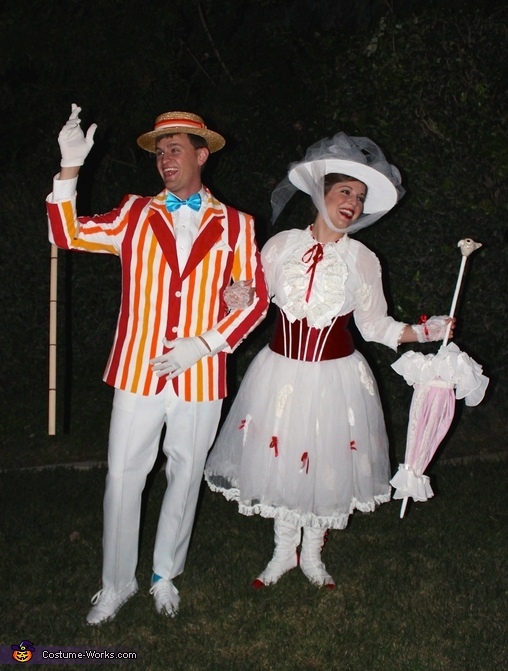 There was no better costume for us to make than that of Mary Poppins and Bert. Tanner could finally have his Bert jacket and I would be most honored to dress up as of the beloved and timeless Mary Poppins. Tanner and I began shopping at as many thrift stores as we could and searched endlessly for pieces that had even a glimmer of potential to make our costumes amazing. Despite my zeal for life and love for laughter, I struggle with severe anxiety disorder. In September, my doctor had me try a new medication but unfortunately, it had a ghastly reaction, which confined me to my house for almost two months. While I was constantly anxious and afraid, I woke up in the morning knowing that while I could not exercise, work, or even leave the house, I, like many others before me, found hope in Mary Poppins. Without fail, I would come downstairs in my pajamas and work for hours on end to perfect my costume. For me, it was not just about dressing up, but it was something I could do that brought me joy and in some strange way, I wanted to make Mary Poppins proud. After all, she was the reason I got out of bed so many days. Now understand, I was not alone in all of this, Tanner, my darling Bert, came home from work everyday and worked on the costumes with me. In fact, while I would love to take credit for his amazingly constructed jacket, it was all him. We make a great team, of course, for we are Bert and Mary Poppins. Tanner and I poured our hearts into these costumes. Yes, we used lots of thread, countless thrift store pieces, paint, zippers, and bows, but our costumes mean more to us than any picture or contest. They represent the imagination and memories we had together. Can't put me finger on what lies in store... But I feel what's to 'appen, all 'appened before. You see, Mary Poppins is not merely a movie; it is a picture full of truth, hope, and of course, a little magic. As Mary Poppins and Bert ride carousel horses through chalk paintings and dance on the rooftops of London, people everywhere gain a bit of magic within themselves. Magic that can help you face a fear, endure the day, or even smile through your tears. Bert and Mary Poppins embody joy and magic that exists despite life’s, sometimes, ugly realities. Tanner and I sincerely hope that our costumes and story, somehow, bring a glimmer of magic and hope to your life. Well now, practically perfect people never permit sentiment to muddle their thinking so let’s move along shall we. First things first, to create a wonderful costume, you must have the proper materials to make it out of. Now don't be disheartened, it may not be as difficult as you think. If you only look carefully, everyday things can make extraordinary costume elements. Tanner and I first began by studying the classic Bert and Mary Poppins Jolly Holiday costumes. We saved many photos so we could refer back to them. Then, we went to as many thrift stores as we could and walked around the store at least once to make sure we didn't miss something that could work for our costumes. We really had to be creative, as they don't sell the exact pieces we needed. For example, I knew I needed the signature white ruffle piece on the front of my dress so I found a shirt with lots of ruffles and imagined how it could look if I cut it up and sewed the ruffles to the white fabric of another shirt and fashioned it to look just like Mary Poppins'. Below, you will see a list of the necessary elements needed to make our costumes and what we used to create them. You can also see some pictures of the original pieces (from thrift stores) that we used to make the elements. Now that you have the pieces you need to create your costume, its time to start taking them apart. You will need a heavy-duty pair of scissors to get you through this step. Trust your imagination and remember that you can never really mess something up. The creation is yours so let it be as unique as your mistakes. Tanner and I had our fair share of “oops” moments but you would never know. It ended up that we just found a different way of doing things. This step is fun but a little challenging because you cannot yet see your costume as you can in your mind, but hang tight, you will get there. The coat that Tanner found for his Bert coat had some embroidery on it and we thought it would be easy to get it out with a seam ripper. Boy were we wrong! It took both of us working for several days just to get the jacket white and ready to be washed. When I was cutting the prom dress that would become the tulle I used for my white skirt, I had to separate the pink and the white layers of tulle. And to be honest, I had no idea how I was going to make it practically perfect in every way. When I was cutting up the white dress shirt to make the boot covers, I had to wrap the shirt around my ankle and cut it- hoping it was the right size and shape. While this may not be the most exciting (or tidy) step, it has to be done and will put you in the position to start creating your wonderful costume; I know it did for us! I started with the ruffle on the white dress. I sewed the ruffles together then synched and tugged until it was is the correct position then I stitched it to the dress. After that, I added lace to the collar and cuffs. Next, I took the funny shaped pieces of white shirt and began fashioning them into boot covers. For several days, I could be found in my pajamas with red heals on trying to fit my new boot covers. The worst part of the entire costume is in those boot covers- the Velcro. For several days, my thumbs were so sore because of how difficult it was to get the needle through that Velcro! After the boot covers I worked on the hat and the corset. I didn’t like how tall the hat was so after I painted it, I cut it and glued it down so it was a bit shorter. I then added the tulle and the tiny red flowers I cut off of the bridesmaid dress. I used that same dress top for the corset. I carefully painted white stripes down the front and then sewed the top of the zipper so the metal pull did not come off of the tracks (it did it so many times before I realized I should sew it at the top to stop it). It was now time to tackle the tulle skirt. After staring at the tulle for quite some time, I decided to give it a go. I figured worst case; I would just pull the thread out. I pulled the fabric tight so it was somewhat like a tutu. Then, I added Velcro and a button and button loop (my first button loop) to tighten the dress around my waist. Next, I hand stitched each lace appliqué onto the skirt and the white dress sleeves. This part was tedious but fairly easy. Finally, I added lace to the bottom of the skirt and made myself some gloves. I had to re-sew the gloves several times because they kept coming apart. The lace I used did not hold the thread well. But with some extra work, they are holding just fine now. The last element I worked on was my parasol. Tanner helped me use a dremel to fit the dowel to the existing wooden skeleton. I added skewer sticks to reinforce the frame. Then, I added the pink fabric from the prom dress. Later, I added the lace and the ruffles. Lastly, I fashioned the bird. To be completely honest, I was not confident I could do this part. I have only used clay a few times and it was nothing noteworthy. But, I began shaping the clay and slowly, it started to look like a bird. Some of you Mary Poppins fans may be curious why I chose to use the Parrot as the original film uses a different type of bird. The iconic umbrella for Mary Poppins is the Parrot and that is what the Disneyland Mary Poppins has on her Jolly Holiday parasol. Hello, Tanner here- now I am going to walk you through the process of making my Bert costume. In order to get Bert’s costume prepared to celebrate a Jolly Holliday with the “practically perfect” Mary Poppins, I had to first rummage through a few thrift shops and then perform a bit of demolition before I could bring the different pieces of this iconic outfit to life. My first task for this project was to prepare the surface of the white jacket I purchased so I could paint the stripes on. For, what was thought to be a simple seam ripping job, the process of removing the embroidered patterns that covered the back and one of the sleeves turned out to be a two person, multiple day job. It involved cutting open the inside of the jacket to get to the back of all the stitching and to clean out all that had already been cut followed by re-sewing everything back shut. It was a process that could have been avoided by purchasing a plain jacket but this was a white pinstriped on white jacket, making it perfect to be painted on giving us a guideline for painting once we were able to start. Before we could start painting (I say we because without Heather’s help, it would have never gotten finished before Halloween), I had to determine what paint colors were to be used to match the jacket best. It was difficult because there are countless amounts of red, yellow, and orange shades so choosing what was thought to be best took a little time and was slightly limited to what we already had! Painting the jacket took the longest to complete during this project, as the lines were not taped off. Also, we made a couple mistakes so a little extra time had to be spent figuring out how to compensate. Since we were working with paint, I was able to tackle a few other projects as we waited for things to dry. I was fortunate to find a sharp white pair of pants that were a perfect fit at a thrift store and all that we needed to do was let the hem out just enough so a glimpse of the iconic turquoise socks could be seen peeking out of the classic white shoes. After the pants came the gloves. I could have very easily gone out and bought a cheap pair of white gloves at the party store, but I thought that since the rest of the costume was being tailored to my specific measurements, I should hand make the gloves as well. I went to the pile of scraps that were coming from the Mary Poppins project, picked out some comfortable fabric, sketched a few hand prints, made some cuts, and got to stitching. I was very blessed to have been raised in the mid-west where we are taught how to sew in school! That experience really benefitted me during this step. Nonetheless, I still ended up with my fair share of finger pricks and mess-ups but I wasn’t expecting perfection when I started the project. I only expected myself to the best I could. In the end, I wound up with two white gloves that fit my hands perfectly! Next was the cane. As hard as I looked, I wasn’t able to find a bamboo cane that resembled Bert’s very own without them being broken or having other issues, so I did the next best thing. I bought a plain everyday wood cane and painted it to look like it was bamboo. I started by sanding down the paint that was on it and then painted it brown. Then after taping off five thin lines, I mixed up a color to closely resemble that of bamboo and painted the entire cane with a brush that gave it the streaked look bamboo has. Then, after removing the tape, it turned out quite well. The last project for the outfit was the hat. The Skimmer hat, as it is called, that Bert wears turns out to be a very expensive and not really thrift shop material. I was able to make do with a hat very similar to Bert’s with a few alterations. The hat I used started out with a flimsy brim and a bit of a domed top, and as you can see in the movie, the original has a very stiff brim, square edges, and a flat top. For this, I took some white thread, not really visible to the naked eye, and I synched down the top of the hat. I pulled the edges to look squarer so that it made the dome become flat. To stiffen the brim, I used craft glue that dries clear. I coated the top and bottom of the brim with the glue. I then proceeded by tacking down the brim to a flat piece of cardboard with wax paper over it. This held the brim flat during the drying process so that when I took it off the board and wax paper, it held its form. The hat originally had a black band around it. I removed that and went back to the scrap-linen pile where I found a cut up white cotton t-shirt. I measured, ironed, cut, and sewed the fabric to form a new band that could be applied to the hat. I measured the lines and painted the new band to resemble the very one used in the movie. I then proceeded to glue the new band onto the hat. This was the last creative bit of construction to my outfit. The last things I needed were turquoise socks and a bow tie. I found these at the store along with a cheap pair of white shoes to complete the outfit. Because there are so many little things we did, I won’t be listing these in order. I spent some time getting my fingers sticky as I put a sealant over the clay bird on the end of my parasol. I initially did this for a protective layer but it also made it look like the bird is made of glass, which was an added bonus. While the parasol was out and open, I realized that some of the skeletal wood pieces were coming out from under the fabric so I sewed some extra loops around the fabric to hold it in place. Then, I found a piece of lace elastic from one of the thrift store blouses to add to the top of the parasol. With the elastic in place and a little added Velcro, I created a way to keep my parasol closed tight while I wasn’t using it. As I mentioned earlier, I kept pulling seams out of my gloves so I added some extra stitching to help them stay put. One of Tanner’s gloves got a run in it so he stopped it using some clear nail polish. After handling my corset, the original threads that had been cut when I was cutting it down to size began to pull- separating the panels. I grabbed some red thread and stitched it to ensure it would hold together. I also sewed over the spot where I took the corset in- just to be safe. After all our pieces were primped to our likings, it was time to get dressed! Being a girl, I took a lot longer to get ready than Tanner did. I started with my hair. I gently pulled my side bangs over to one side and pinned them. I then twisted my hair tightly into a long oval shaped bun. I added a little bit of brown eye shadow to my hair along the rim of my face to make it look darker than it really is. Then I did my makeup. I did the basics: foundation, concealed (for the not so practically perfect spots on my face), eye shadow, mascara, bronzer, and eyeliner. Because Mary Poppins’ eyes are blue and mine are not, I added a small line of wet dark blue eye shadow under my eyes to give them a blue hue. I then used a lot of blush for rosy cheeks (…no warts). The final touch was the most rewarding- the bright red lipstick. As I applied the lipstick, I could almost feel myself becoming Mary Poppins. Then I put on my costume and I don’t think I have ever stood up straighter or talked as proper. I had done it- I was Mary Poppins. Tanner and I weren’t even prepared for the response that we received with our costumes. A night of waltzing around in our costumes turned into a full-on meet and greet session with hundreds of parents and children. We began by passing out candy in full costume and character. We spoke in British accents and talked all about chimney sweeps and magical carousel horses. The children loved it but the parents couldn’t get enough. We were even voted best costume and won the contest! We danced, smiled, sang, and waved all night long. I wish I knew how many pictures we took that night- all I know is that I could barely smile at the end of the night. But at the same time, I couldn’t help but smile.